Heading back up to the Finger Lakes of New York for a quick look at a store I'm pretty sure was previously an A&P. We saw the former ACME in Bath, NY a few weeks ago. Like that store, this supermarket has been repurposed as a non-grocery store. The peaked facade and side-facing entrance makes me pretty sure that this building was an A&P! We have a few more stores in the Finger Lakes to check out over the next three days. This store is located at 121 Liberty St, Bath, NY. Great find! This building was definitely an A&P. It looks similar to the models in Metuchen (demolished for a CVS) and the now-remodeled Summit store. However, the wood paneling throws me off... was it possibly a later addition? Most likely. 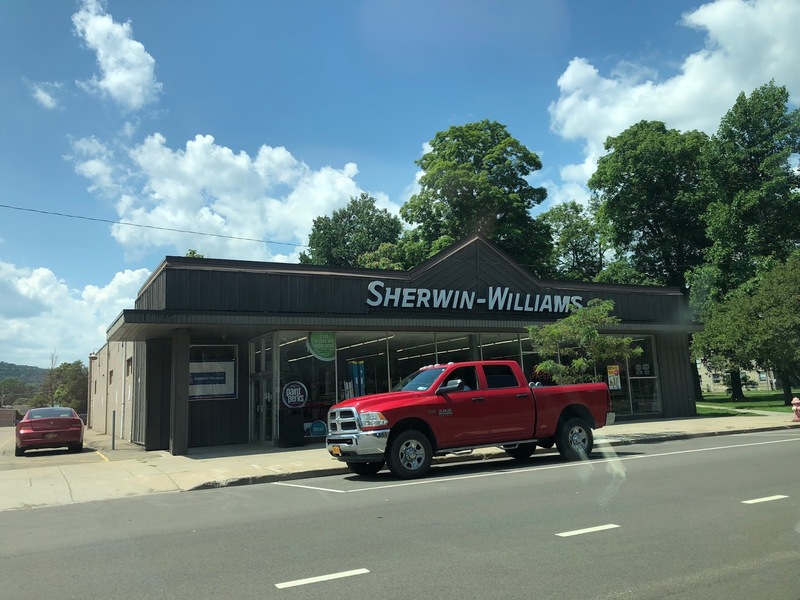 I don't know what tenant(s) were here between A&P and Sherwin Williams, but it's been a long time since A&P was up here in the Finger Lakes -- so we could be looking at an A&P that closed back as early as the 70s (or 60s? ).